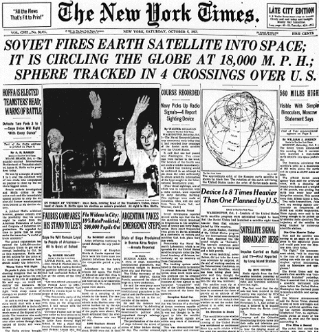 On October 4, 1957 news broke that the Soviet Union had successfully launched the first man-made satellite into space. Sputnik prompted a national panic, not simply over a looming Cold War – the possibility of Soviet spying or bombing, for example – but about the purported failures of the US education system. “The schools never recovered from Sputnik, ” education researcher Gerald Bracey contends. According to historian Robert Divine, President Eisenhower was “not impressed by the Soviet Fear. … He believed that American science and American education were much sounder than critics charged, and, above all, he was confident that the United States held a commanding lead over the Soviet Union in striking power.” But the President couldn’t compromise the military intelligence that reassured him that the US was ahead of the USSR in science and in education. And he failed to reassure the public or politicians or journalists that that was the case either. One year later, in 1958, Eisenhower signed into law the National Defense Education Act, a cornerstone of his administration’s response to Sputnik. The law helped reshape education in the US with a massive influx of federal dollars. And it served to give education technology in particular not only funding and legitimacy but its ideological mission: a corrective to progressive education in the name of national security and science. Progressive education was already under attack in the 1950s, with accusations from scholars and scientists that it was contributing to a growing anti-intellectualism in the US. It was, according to one admiral, making us “soft.” Progressive education, according to its critics, had become an excuse to not teach a huge swath of schoolchildren how to read and write and do arithmetic. Traditional disciplines were not taught well (or not at all), as the emphasis in schools had supposedly turned instead to “life adjustment” and to vocational, “how to” education. The curriculum along with teachers’ training, these critics argued, had to be more rigorous if American society was to survive. 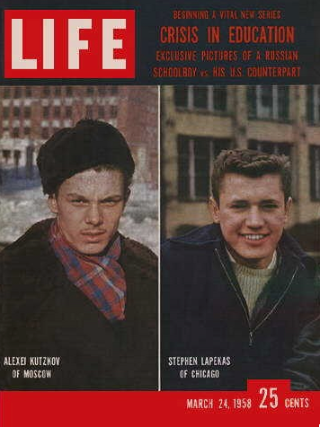 LIFE magazine also ran a five-part series in 1958, comparing schools in the US and USSR. Moscow student Alexei Kutzkov was depicted, serious-faced, performing advanced experiments in physics and chemistry. Chicago student Stephen Lapekas was shown laughing, retreating to the back of the class after he failed to solve a simple geography problem on the blackboard. 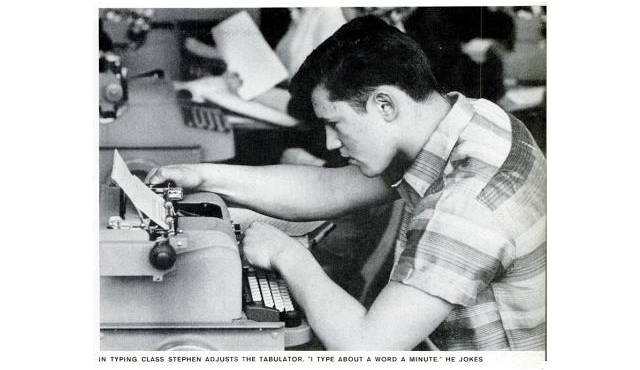 In typing class, Lapekas jokes, “I type about a word a minute.” Schools in Russia were “austere.” Schools in the US, “relaxed.” The former were exposing students to complex materials like “Shakespeare and Shaw”; students in the US were years behind academically, and they were distracted, surreptitiously reading magazines in class. Teachers were not in control. Schools became a scapegoat as Cold War hysteria kicked in. Title III authorized $70 million per year of the NDEA’s four year duration to strengthen science, math, and foreign language education. Title IV established a national fellowship program to be awarded for graduate education, with some of the money earmarked for those interested in becoming college professors. Title V authorized funding to train guidance counselors and to implement standardized testing programs that would identify “gifted and talented” students. Title VI authorized funding for Language Area Centers and Language Institutes. Title VII authorized funding for both the research and implementation of new education technologies, including radio, TV, film, and yes, teaching machines. Title VIII provided funding for vocational training. Title IX established the Science Information Institute and Science Information Council, operating under the National Science Foundation, to advise the government on technical issues. Title X provided grants to the states for improving data collection and statistical analysis by state education agencies. There has long been resistance to federal involvement in education in the US, but pushing for more aid for education was always a cornerstone of Lister Hill’s efforts as a senator – efforts that had failed repeatedly. This was further complicated for the Southern politician by Brown v. Board of Education, prompting Hill to insist that the demand for federal funding was not the same as a call for federal control of education. In 1956, the first piece of legislation that would provide federal aid for education came before Congress since the Supreme Court’s decision in Brown. Congressman Adam Clayton Powell, an African American representing Harlem, proposed an amendment that would prevent any states that operated segregated schools from receiving federal funding. Indeed, he vowed to attach the amendment to any education-related proposal. That same year, 101 Congressmen signed the “Southern Manifesto,” making clear their opposition to racial integration of public places, including schools. Both Carl Elliott and Lister Hill, the sponsors of the National Defense Education Act, signed the manifesto. Fortunately for Hill, and for Carl Elliott, the opportunity presented by Sputnik for passage of landmark legislation in federal aid to education was not neutralized by the segregation issue. The federal administration that worked with Hill and Carl Elliott on NDEA was not inclined to support Powell amendments that prohibited racial discrimination, and Hill and Elliott were able to work successfully with the administration to neutralize the Powell amendment in the final version of NDEA that came from a conference committee of the House and Senate. What emerged was a bill that said nothing about racial discrimination but was interpreted to be antidiscriminatory in all its titles. There are many provisions in the NDEA that have had a lingering impact on education policy and politics – the push for standardized testing; the legitimization of education technology; and most significantly perhaps, the authorization of federal funding for schools and for education initiatives. And it’s noteworthy, of course, that it was the launch of Sputnik that crystallized the efforts to pass the legislation – it’s worth considering how, despite the testing and technology and funding, education has been unable to escape from the crisis (rhetoric) since then either. both a science education and a much-more-than-science education measure, and it broke the dam against federal aid to education through astute use of a national defense metaphor by all its proponents. Further, it had liberal democratic provisions pointing toward equity in some of its titles and excellence oriented policies and practice in other titles. The liberal aspects of NDEA pointed toward its immediate successor measures such as ESEA and two higher education acts, but its excellence titles pointed toward the repudiation of equity in the interests of educational excellence that would be the goal of federal educational policy after 1980. Where does education technology, with its roots in the National Defense Education Act, exist on that spectrum? Has ed-tech ever furthered equity? Or has it always been about educational measurement and achievement, always wielded to serve arguments about the failures of public education and to stoke fears about Others?